Olimpia Van Landingham obituary. Carnes Funeral Home. Jun 17, 2012 The Carnes Funeral Home Staff offers our sincerest condolences to the entire Van Landingham family. It was our honor to serve your family. Olimpia VanLandingham lost her battle with cancer on Wednesday November 23, 2011. Olimpia was born March 22, 1929 in Panama City, Panama. She was a loving daughter, mother, grandmother, great-grandmother and friend to all. She was most well known for her lovely spirit and humanitarian heart. Among her favorite past times was spending time with her family and watching all her grandchildren and great grandchildren grow. She will be dearly missed by all those whose lives she touched and was a special part of. Olimpia was blessed with a long life filled with the memories of those that were close to her. She was married for over 40 years to her husband, Charles VanLandingham, and together they brought her family to the US from Panama. Olimpia and Chuck enjoyed living in several different places such as The Philippines, Texarkana, and San Antonio before settling down in the Houston area. 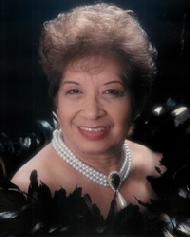 Olimpia was employed by the Harris County District Attorney's office for 20 years before retiring. During her retirement she enjoyed selling Mary Kay along side her daughter, often being the highest producer for the entire unit. She was never far from her two children Lino and Olimpia, and even closer to their children. In November of 2010 she was diagnosed with Duodenal cancer, which is a rare cancer in the intestine. The cancer was removed with a surgery but in March of 2011 she was diagnosed with Peritoneal Carcinomatosis, a cancer in the lining of the abdomen. She fought bravely through two rounds of chemotherapy at MD Anderson and her will to live was very evident. She never complained about the therapy and she would never tell anyone how bad it made her feel. Olimpia always tried to have a positive outlook and reflect back on the great life she had and how blessed she was to have lived for 82 years. She spent the last few months of her life being visited by many people who loved her and who came very far to see her and that comforted her soul. She was always more worried about making sure that her family was going to be taken care of rather than whether or not she was going to be ok. She touched countless people with her kindness, and we are all better off having had her in our lives. She is preceded in death by her parents Manuel and Elvira Aguilar; her husband Charles VanLandingham; her brother Manolo Aguilar, and her sister Ada Aguilar. She is survived by her son Cesar Lino Perez and daughter Olimpia Miranda, whom she loved dearly and was very proud of; her sister Liana Aguilar; her grandchildren Lourdes Sicardi, Ricardo Jovane, Lina Perez, Ana Raquel Perez, Luis Miranda, and Jessica Perez; her great granddaughters, Mareni Sicardi, Andrea Sicardi, Gabriella Jovane, Adrianna Fernandez, Andrea Fernandez, and Ariadne Fernadez; her nieces, Myra Shamshiri, Mara Guerra, Ada Guerra and her daughter Gina De Gracia; and numerous cousins and countless friends. The family would also like to send a special thank you to Armando and Graciela Victoria and their family, Mario and Carmen Perez and their family, David Martel and Patricia Carnes and their family for all of their support during these trying times.